The lake of Buttermere is surrounded by the significant high fells of High Stile to the south west, Fleetwith Pike and Haystack to the south east, Robinson to the North East and Grasmore to the north west. Such walks would be considered as moderate walks. This lovely four and a half mile walk around Buttermere is more a good quality family walk of great beauty, almost entirely on good foot paths. Of special interest on your Buttermere walk is where the foot path passes through a rock tunnel. Whilst considered by many to be the most beautiful of all the lakes within the Lake District. The village of Buttermere is situated to the north western edge of the lake and very busy on weekends and school holidays. Within the small church of St James, on the fringes of Buttermere village at the junction of Honister and Newlands passes, you will find a stone memorial tablet set into a south facing window sill to commemorate Alfred Wainwright. The window looks outwards towards his favourite walk, Haystacks. Where it’s interesting to note his ashes were scattered. You will find car parking in the small car park near the Fish Hotel or on the main road. Start walking down along the rough farm road to the left of the Fish Hotel. With the road bending towards the left go through a gate. After approximately 140m go through the gate ahead of you and follow the clear foot path towards Buttermere lake. Do not go through the gate to the right which leads to Scale Force. Pass through the further gate at the lake side which is a National Trust sign. Turning right towards Sour Milk Gill, which you should see coming down the mountainside before crossing the small bridge. As with all Lake District waterfalls and streams there best seen after a nights rainfall. With the name Sour Milk referring to the white water and its similarity to off milk. Having crossed the small footbridge, turn left and go through the small gate into Burtness wood. Following the clearly marked path along the waters edge continue upon your route. You will come to a split in the footpath, and keeping to the waters edge path continue on. After about ¾ of a mile pass through a small gate, continue upon the clear path until you come alongside a stone wall and cross a footbridge. Once over the bridge make your way along the lakeside path between the fences. At the farm, go through the small gate and turn right alongside the stream to the road. Turn left over the bridge. After a short distance the road once again runs by the lakeside, before bending away yet again. Return to the footpath along the waters edge for one mile. Here you will pass through a tunnel of rock making your way to the far end of the Buttermere lake. With the lake shore to your left you will see a small gate to go through and up rough rocks to another small gate following the clearly marked pathway. This will now take you back to the village of Buttermere. No matter where we live, we love our walks, family walks, walks with the dog or solitary walks for thinking. Yet if we could all pick a walk for all seasons that was close to where we live I think this might just be it. This is a great family walk. A Tarn Hows walk may simply consist of a walk around the lake, although I would advise to include a short diversion down to Glen Mary Bridge, returning via the waterfalls, thus adding a mere mile to your walk. Monk Coniston Hall was once home to the 19th century industrialist James Garth Marshall, the Victorian creator of Tarn Hows which is located between the villages of Coniston and Hawkshead. Tarn How may be somewhat artificial by nature, whilst set within one of England’s grandest National Parks, yet the beauty and splendour are considerable. As a result of this and sharing similarities to Cat Bells walk vast numbers of visitors are attracted here each summer. Therefore it may be better to do this walk out of season, when you may be fortunate enough to be rewarded with the peace and tranquillity the scenery and setting deserve, without the large number of visitors and those having summer picnics. 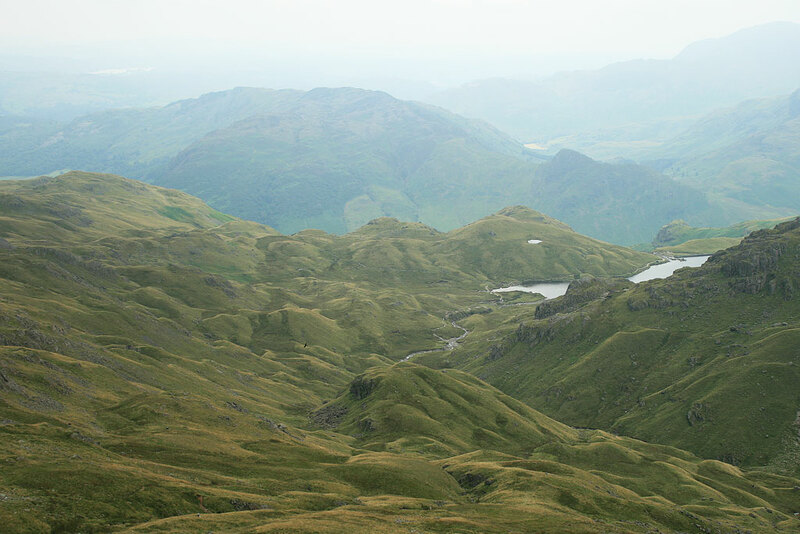 You may consider walking the picturesque route created by James Garth to wow guests at his country residence of Monk Coniston Hall to Tarn Hows or from Coniston village. Either way you will be rewarded with some wonderful scenery and look out for the Old Man of Coniston walk, maybe for another day. Leaving the car park entrance closest to the lake, turn right along the road. Almost immediately leave the road and the track curves left. Within a short distance fork left onto a grassy path. Follow the path over the top of the ridge and down the far side to meet a wall on the right. The path continues down hill , curving left and then right. Continue on through the gate, at the wall corner bend left. Upon reaching the ruined barn follow the wide track to the gate. In the lane turn right and continue down the path to the road at Glen Mary Bridge. Crossing the footbridge over the stream to the right and turn right through the small gate. Continue up the left hand side of the stream. Keeping with the stream as it bends its way past the magnificent waterfalls you should see signs for ‘Tom Gill Waterfall’ Once at the top of the fall go through the small gate in a fence, making your way up the path along the stream to reach the Tarn Hows at the stream outflow. Here you should see a broad well maintained path. This path goes completely around the tarn, ultimately returning to the stream outflow and concludes your walk. National Trust The Tarns are given in memory of Sir James Scot of Yews and of Anne Lady Scot, 1930. The view from the memorial stone over Tarn Hows, is superb and one of the best, most photographed in all of the Lake District. Not forgetting that the tarn is artificial and the water level was raised by a dam and weir constructed at the south west tip, thus creating a single tarn. With trees alien to the Lake District were planted. This is a great example of what can be achieved by sensible and creative countryside development. The name ‘The Tarns’ refers to its earlier existence prior to the raising of the water levels with the damn, when there were several stretches of water. Grisedale walk should not to be confused with Grisedale Pike which is situated I would say as in the Keswick area of the Lake District. This walk is close to the Ullswater lake area and follows the Grisedale Beck towards Sheepfold and therefore in definition I would consider this a Ullswater walk. Grisedale is a low level walk surrounded by such majestic household names as St. Sunday Crag and the Helvellyn range. Helvellyn via Striding edge is not too far away and this walk is an ideal way of working up to such a rewarding high level walk whilst getting to know the Patterdale, Glenridding and Ullswater area, which I would strongly recommend. This is a circular walk starting in Patterdale village car park. After crossing the Grisedale Beck via a footbridge, returning along a good track and country lane. It is a great walk for all the family with stunning views. Joining the main road from the gap in the car park wall, cross the road and start to walk left. At the end of the shops , bend right and continue up a track. Follow the track round right and then take the footpath, left, as signed posted. Follow on through a copse to reach a wider track. Turn left and go through a gate onto the fell. At the wall corner take the step stile over the wall. The stile is hidden by a tree and is signed posted on the far side. Walk on the left after crossing the stile and follow the clearly marked route over the fields to a gate and onto a track. Turn right and continue walking on to join the narrow country lane that leads from the village into Grisedale, turning left. Looking over the wall you will see the Grisedale Beck flowing, hurriedly white topped, through this very deep wooded area. Climb the hill and, prior to the first gate over the road, turn right along a country lane. Where it turns right take the gate ahead and climb the steep grassy slope. Looking backwards you can take in the view of the dale below you. Go through the gate in the wall and look for a four pointed signpost. Turn left following the clearly marked direction of Grisedale. Walk along this path high above the beck, as it continues into the dale. Pass through an iron gate in a fence. Continue on along the footpath, before going through another iron gate, with pine trees below to your left. To your left, across the vale, you can see Birks and St Sunday Crag. Ahead and above are the mountains at the head of the valley. Upon reaching a ruined shepherd’s hut, take the left turn just before a wooden gate. Descend via the stone wall, then following the green trod (an old sheep droving road) which today is rather unclear to see these days. Continuing on where the path goes left around a small knoll until you find the gate in the wall. Once through the gate you will see a footbridge crossing the Grisedale Beck. St Sunday Crag is now clearly visible before you and cross reference with your map will help you know your exact spot. Its at times like this you truly get to understand the area where your walking and become familiar with your surrounding. This can really help if the weather turns bad and especially if you go on to do high level more arduous local walks. Once across the Grisedale Beck footbridge follow the narrow path left until you join the more substantial wider pathway. As you now continue to walk upon your homeward part of your walk and return to Patterdale, take a minute to look across the Grisedale valley towards the crags and beyond towards Striding Edge. Further on you will pass Elmhow farmhouse on the right of the pathway and above you will see Elmhow and Harrison Crag. On your left you should take a minute to look at the waterfall and if there has been rain on previous days you should see plenty of white water running over fall which makes it so much more worth while seeing. If during any stay in the Ullswater Lake area there has been plenty of rain I would always recommend visiting Aira Force waterfall for a walk. Continuing on you will come to an arched stone bridge on your left which spans the Grisdale Beck. Keeping to the footpath eventually you will come to a gate which completes the circular route that is Grisedale. It is at this point you have completed the walk and have a choice as to whether to make it a figure of eight so as not to retrace your own footsteps. So to go a different route follow the road down into Patterdale and turn right along the main back to the car park.